At LEW Electrical Distributors we have invested in over £3.5 million worth of stock across our 11 branches. With a comprehensive stock range from the most reputable brands in the industry, our customers can have the confidence in knowing they are buying quality products at a competitive price. LEW are long-standing members of the national ElectraCentre network. This allows our customers to pick up goods from any of the 190 ElectraCentre branches in the UK and be invoiced by their local LEW branch. This makes it ideal for customers to get their usual great prices from LEW while working away. Thousands of LEW products are now available in just a few clicks with the all new LEW Mobile App that gives customers 24/7 access to ordering. 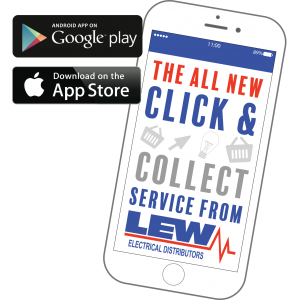 Available on Apple, Android and desktop, the LEW app is regularly updated with the latest products and promotions from LEW. Looking to use the App? Speak with your Sales Accounts Manager in your local LEW branch and we aim to have your Mobile App account set up within 48 hours, for an even easier buying experience.